Tottie Tomato began her life on another blog that I used to write, in September 2007. 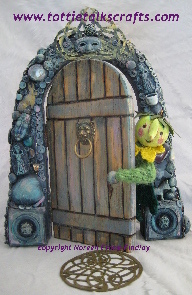 Tottie has had many adventures, and has undergone several transformations. She’s just had another one! 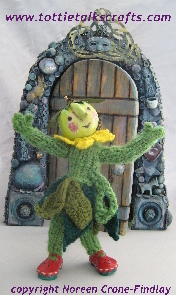 Tottie Tomato has emerged once again from the Story Door and she is delighted with her new body! 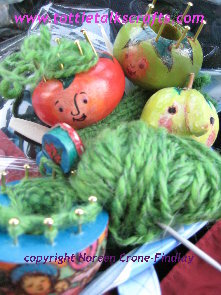 Tottie Tomato and I look forward to talking about all the crafts we love – spool knitting, small loom weaving, doll making, puppets, crochet, sewing, knitting, tatting, recycling and refashioning…. to name just a few. Tottie and I will be sharing all manner of tutorials and look forward to visiting with you often – and, oh yes, Tottie loves contests, so there will be contests! Please note that all text and images are copyright Noreen Crone-Findlay, and are her original work. They are not to be copied or used in any way without Noreen Crone-Findlay’s consent. Noreen! I love this!!! I’m so utterly thrilled that Tottie has found her way in a more permanent basis in the world. She has amassed quite an audience of fans and needs to be out her in all her Tottie-glory!!! Kuddo’s for a fabulous joy. This blog is now in my toolbar for fast and easy access. I AM SO THRILLED!!! I’m so pleased that Tottie will be tottling our way more often. The new elf suit is adorable, Noreen. You are sooo creative! I love Tottie. Do you sell any Tottie dolls? Sorry to be so far behind in catching up with my email… things have been crazy hectic around here. I have plans for Tottie Tomato , but things are wild and crazy busy…. so I will dance as quickly as I can! Hey Noreen. Sounds great. My parents would think Tottie is so cute. They grow tomatoes for a living! Thank you, Peggy! and how neat! Tottie Tomato should make a field trip….. Sorry I missed your comment! Gmail stacks up messages, and sometimes I miss them…. oops! Thank you so much for welcoming Tottie Tomato! I’ts been a wild and wooly time lately, so I am scrambling to catch up.